DISCLAIMER: This is a work of fanfiction for my personal entertainment (and maybe yours). Dragon Age II and all related characters and locations are the property of Bioware Inc. RATING: Grown ups. Cassella's lip was bleeding and her right eye was swollen shut, but her great ax was bloody and several of her opponents were missing body parts, including at least one head. Isabela looked only slightly better than her partner, but she was grinning madly at Cassella and breathing heavily. Cassella grabbed her by her bodice and kissed her hard, oblivious to any pain and blood. 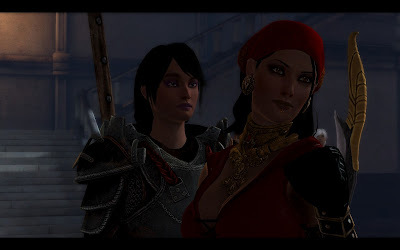 Isabela laughed and took Cassella by the hand, dragging her through the alley, pausing for more kisses and fondles and to pick up a ridiculously gorgeous elf whore they passed on their way. The elf snored softly between them in the bed. Isabela traced a finger along his skin. “Can we keep him?” she grinned, her eyes twinkling. Their boisterous mirth woke the sleepy elf and he soon fell prey once again to the appetites of his midnight companions.